Kp Index has gone blue-red today so we should be getting some movement soon. The planetary Kp-index is a globally averaged indicator of the worldwide level of geomagnetic activity. The official Kp index is derived by calculating a weighted average of K-indices from a predetermined network of geomagnetic observatories, the official Kp network. Since some of these observatories are not currently available to SWPC in real-time, it is necessary for an operations center such as ourselves to make the best estimate we can of this index from a subset of the official network. 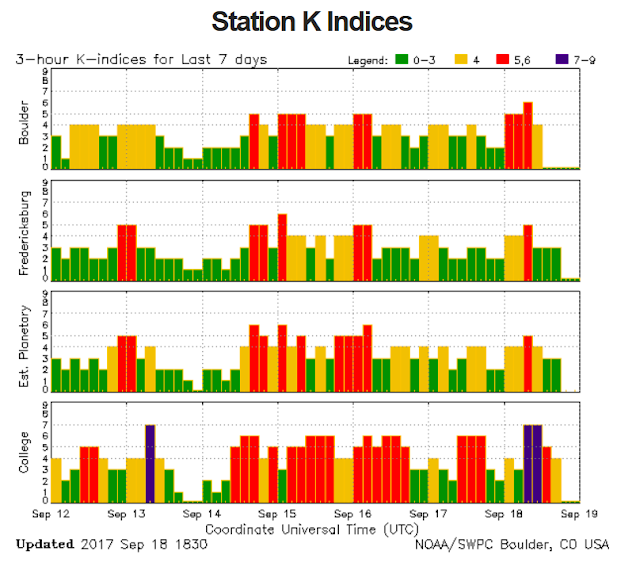 The Space Weather Prediction Center calculates near real-time estimates of the Kp index using eight of the thirteen official Kp network stations. The network of contributing stations is provided through cooperative efforts between SWPC and data provider partners which currently include the U.S. Geological Survey, Natural Resources Canada, the British Geological Survey, German Research Centre for Geosciences (GFZ), Geoscience Australia, with important supplemental contributions from the Institut de Physique du Globe de Paris, and the Korean Space Weather Center.